An article in the current issue of The Cleft Palate–Craniofacial Journal explored the reasons behind the multiple follow-up surgeries required by cleft lip/palate. The findings showed that there was a zero to 100 percent instance of revision surgeries among the various studies. The Cleft Palate–Craniofacial Journal – Children born with cleft lip/palate go through extensive treatments that usually begin before their first birthday. Most treatment plans include surgery to repair the orofacial cleft, which will increase the child’s verbal communication abilities, self-esteem and overall confidence. Unfortunately, a one-time surgery is rare. Many children require revision surgeries to create the correct alignment, symmetry and normal facial movements. As a result, health providers are constantly looking for ways to decrease the number of revision surgeries required for children with CL/P. 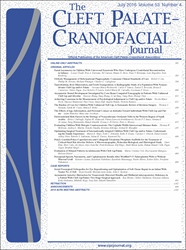 An article in the current issue of The Cleft Palate–Craniofacial Journal explores the reasons behind the multiple follow-up surgeries required by the condition as well as how their frequency may be reduced. In order to determine a percentage of revision surgeries, the authors conducted an electronic search of previously published articles relating to cleft lip surgery. Of the 3,034 articles identified, 45 met their study criteria, which yielded a total of 4,210 patients involved. Overall, the research showed that there was a zero to 100 percent instance of revision surgeries among the various studies. However, the researchers were unable to determine the burden of care (amount and intensity of all treatments) experienced by the patients. When analyzing the specifics of each study, authors found that revision surgeries could be affected by the following: isolated cleft lip compared with cleft lip and cleft palate corrections, the portion of the lip where the surgery was conducted (specifically, the vermilion or vermilo-cutaneous junction), and the follow-up duration, with more revision surgeries resulting from longer follow-up times. The authors also found that the quality of the initial surgery plays a very important role in revisions, especially when dealing with the vermilion junction, and it was determined that closing the vermilion could reduce the need for revision surgeries. This study has provided a strong foundation for future studies on cleft lip revision surgery. The authors concluded that a new population-based study should be conducted for more definitive findings on the burden of care for unilateral cleft lip. Such a study would help to further reduce the current reliance on surgical care and improve outcomes for patients worldwide. Full text of the article, “The Burden of Care for Children With Unilateral Cleft Lip: A Systematic Review of Revision Surgery,” The Cleft Palate–Craniofacial Journal, Vol. 53, No. 4, 2016, is available at http://www.cpcjournal.org/doi/full/10.1597/14-202. The Cleft Palate–Craniofacial Journal is an international, interdisciplinary journal reporting on clinical and research activities in cleft lip/palate and other craniofacial anomalies, together with research in related laboratory sciences. It is the official publication of the American Cleft Palate–Craniofacial Association (ACPA). For more information about the association, visit http://www.acpa-cpf.org/.